For us, the dead of Pittsburgh winter signals the need to get to fun in the sun, but try traveling with tweens and teens and the planning that makes you smile does not exactly bring on the family happiness. If you are like any other family I know, the hardest people to please on a family adventure anywhere are the tweens and teens. I don’t know if is hormones, their want to try to command their own lives, yet they want to be with you (eyeroll) or just the decision to leave their friends, but packing up with this age demographic is always a rough go. My planning for our winter trip includes the top 5 interactive family adventures in Florida, providing the kids the chance to zipline, check out Gators, enjoy Rides, family shows, animals, experience science at its best and some great ‘broadway-like’ entertainment while eating a fun Italian-style dinner. Our plan, as pro family travelers with our kids is to let them have experiences that allow them to participate in the fun in some way, keeping them very busy. Are you ready to lavishly live family travel out loud and learn the top 5 interactive family adventures in Florida? No one said that parenting would be without challenges and when you travel it seems like the challenges of parenting increases. Lack of sleep, normal schedules and familiar environments lend itself to quick spats between siblings, disagreement of where to go and when and of course just general testiness. We have found the best way to combat the crazy challenges is to set out some type of schedule that need not be adhered to exactly but does lay the ‘ground rules’ or the floor plan of the trip. The more everyone knows about where they are going and what to expect the better the chances the kids will enjoy and indulge in it. We don’t ban the smartphones in fact we encourage them to take great family photos and hashtag them so that we can find them later and enjoy! We make a game of it and we look for the Family best photo, for which the winner gets a framed picture of their photo! Finally, we know that our tweens and teens are love their smartphones and experiences that they can be part of so we challenge ourselves to find fun where the kids can experience the adventure. How do you experience and adventure? I will tell you it is not by sitting plainly in a 3D ride, ride after ride, ad nauseam as we have done in Universal, where everything is so much the same, rather we seek out fun where the kids can touch, feel, learn, and enjoy and that we can watch our kids enjoy and gain happiness from their smiles. The more the kids can walk, the more they can experience, the more they relate back to school, and life making it beneficial, and fun! 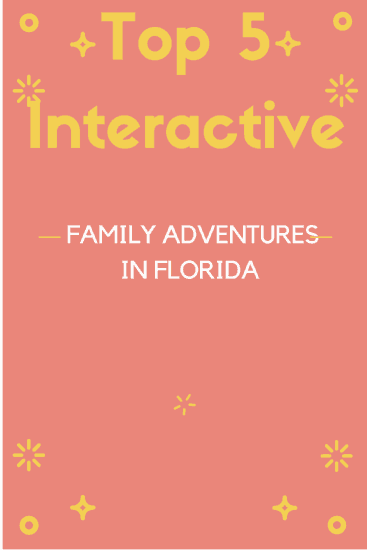 So enough with what my thoughts are, here is our upcoming top 5 interactive family adventures in Florida. There has been only one time in our lives that my husband and our family have stopped in Florida and not gone to Disney and trust me it was only because we were headed to a cruise and could not jam any more into our itinerary. Disney is so much fun, with kids, without kids, as a couple, single, it is just fun. There is no where else that we have been that brings out the kid in us more, that a ride in Disney or in viewing a show. One thing we have become accustomed to is that we are so familiar that we are never unfamiliar with our surroundings and the kids know Disney and all its parks like the back of their hand. Shows, adventures, food and rides, everything that you can possibly imagine is what happens in Disney. We love that we can miss a year at Disney and not miss a beat because the incredibly familiar environment brings back memories with each stroll down Main Street, each plunge on the Rock ‘n’ Roller Coaster and every Kilimanjaro Safari Ride. Each time we travel back the kids find new things to gawk at, and with every trip, we find more Mickey’s that we did not see before. The challenge to us is not if the kids will have fun, but if we will have enough time, because it is the most magical place in the world and we need it to be clockless! Amusement, animals, shows rides that is how you achieve the ultimate in family fun and we are ready to challenge our kids to the coasters, shows and animals that Busch Gardens, Tampa offers. Our question to the kids: Who is going to wimp out? LOL! If I had to bet it will be me because heights do me in as you all know. The kids are ready for Kareebu Jungala show and many other fun shows as well as meeting up with orangutans, cheetahs, zebras, kangaroos, tigers and more! Busch Gardens offers something for every age group, and experiences that can be close and personal or just watched through the distance, it is all in what you want your fun to be. Stay tuned to see our experiences and track with hashtag #BuschGardens. What would it be like to Zip line above gators? Would it be cool to see gators up close? Do you think they are scary or are you intrigued? These are the questions I asked my tweens and teens and guess what, a little smile of curiosity came about. From the shows of Up close Encounters to Gator Wrestlin’ to the actual experience of Zip Lining above Gators, the kids are going to have a blast and I personally can’t wait. This is the Bucket-list item for me and I am super-excited to cross it off! Want to see what we will be up to? Follow along on #Gatorland and I am sure you will be able to see all the fun. While not quite interactive it is delicious and the food is allergen free, signature burgers and incredible milkshakes. Definitely a family atmosphere with beverages for the adults and kids. Get ready to fill your bellies! We can’t wait to share our travels and lots of great insider’s tips including where to dine if you have food allergies while inside the parks, and throughout Orlando and Tampa area. Here’s to sunshine, fantastic memories, great food, great family time and a whole lot of that family adventure time. Lavishly live family travel out loud and follow along on our Top 5 Interactive Family Adventures In Florida. These all sound like great places. When my kids are a little older I definitely want to take them to Disney. They love going to our local Busch Gardens too. I’ve never been to Gatorland before or ziplining. I think I would love to try both of them! I would love to take my kids to Disney some day. My wife has never been. So it would be a treat for the whole family! These all sound like awesome things to do! My fiance and I are planning to go to Florida for our Honeymoon because we got engaged at Disney so it’s nice to know there are some more things for us to check out while we are there! I love Disney too. I’m so ready for another trip up that a’way. These all look so fun. I can’t wait until we have kids and an excuse to go!! I love dinner shows! I don’t necessarily have to have a buffet although I wouldn’t argue about it. 😉 Like Robin said, I also enjoy Universal! Great list looking forward for spring and vacation time. I never knew Florida offer so much beside the Beaches and Disney. Bush Garden of Tampa sounds interesting and having friends in the area is appealing. Next time someone said vacationing in Florida I am able to alert them to these other places thanks for sharing. Oh Florida is so much fun, and there is always something to do. I love Florida for Family Tours because of its diverse possibilities! I have friends who live in Florida and its a place I have on my bucket list as well as Disney being on the list. My wife and little one have been to Euro Disney, but I was not able to do. /Cry. I’ve always wanted to go to Florida. I hope to bring the kids there this summer. Kids would definitely love going to Disney and the Space Center! That’s a lot of fun. Thanks for sharing these places and activities! as someone who as lived in Flordia i can say that these suggestions are great. Especially Disney! My family loves visiting Disney, it was fun and we were going to visit again in Disney this year. This past year we visited the Great Escape Room in Orlando! It was so much fun. Family works together to solve puzzles in a room and escape. Cool to know that there is more than Disney. I do love Disney though. Those are all fun! Universal Studios is a blast, too!